Eggplant. For a long time it seemed to me as if being vegetarian meant eating eggplant. I’d go into a restaurant and the one vegetarian item on the menu would be ratatouille, eggplant Parmesan, or pasta with eggplant. Though currently the ubiquitous vegetarian item seems to be hummus, there are still restaurants I visit where the only vegan option is an eggplant sandwich (panini, wrap, sub, or whatever, depending on the sandwich trend du jour), so if I didn’t like eggplant, I would be shiitake out of luck. Fortunately, I don’t just like eggplant, I love it. The most versatile of vegetables, it can be sautéed, poached, baked, roasted, grilled, pureed—even stuffed. Try that with your broccoli! So what to do? I say, skip the oil completely and rely on other ingredients and seasonings to flavor your eggplant. I know there are those of you who don’t like eggplant unless it’s fried—or don’t like it at all—so I’ve been looking for new ways of cooking it that do away with the bitter flavor that eggplant can sometimes have and eliminate the need for oil. Success! The ragout cooked in record time, and the eggplant was mild and delicious. Some of it broke down to become part of the sauce, but there were still plenty of cubes of deliciously flavored eggplant. 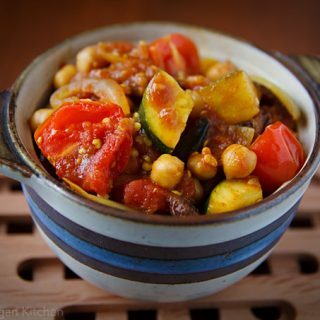 Maybe I’m prejudiced because this aromatic stew contained so many of my favorite ingredients—chickpeas, cumin, smoked paprika, and quinoa as well as eggplant—but it’s one of my favorite dishes. Traditionally a stew like this would be served over couscous, but I prefer sticking to whole grains, and quinoa works perfectly. Sauté the onion in a large non-stick pot until it begins to brown, adding a little water if necessary to prevent sticking. Add the garlic, and cook for another minute. Add all spices, including cinnamon stick, and stir for another minute. 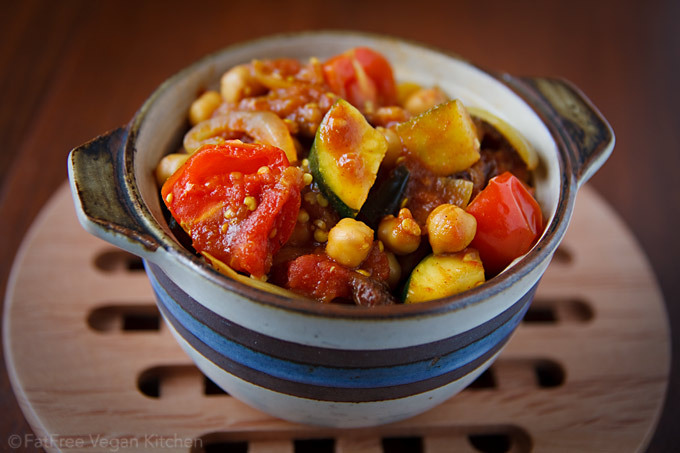 Add the zucchini, canned tomatoes, chickpeas, raisins, and vegetable broth and bring to a boil. Reduce heat and add the eggplant and cherry tomatoes. Cover and cook on low while quinoa is cooking. Remove cinnamon stick. 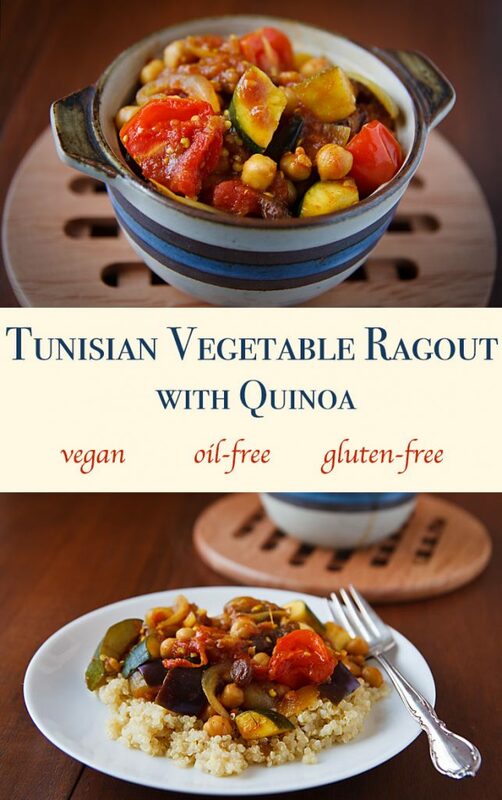 Spread a bed of quinoa on each plate and top with ragout. If you can find paper towels that are certified okay for microwaving (some contain metal fibers, so beware) just use a double layer of them instead of coffee filters. A dish towel (not terrycloth) or double layer of cheesecloth would also probably work. I’d stay away from parchment paper because I don’t think it is absorbent enough. Mmm!!! I haven’t had eggplant in a while, so this dish is a wonderful reminder. So true about the ubiquitous restaurant menus! Except we used to joke it was portobello mushrooms. Would love to have an eggplant right now to experiment with! what is the purpose of the coffee filters? I can attest to microwaving eggplants too. I try to use Indian or Japanese eggplants, because of their low water content. I spread them out on a plate an nuke for 15-20 minutes depending on how watery the eggplant is. I end up with dry peices that can be sauteed in olive oil. Another approach is to take a whole globe eggplant, poke a few holes in it with a fork, and microwave for around 10 minutes. Then peel the eggplant and use the pulp in your favorite bharta/chutney or hummus. I just started making eggplant soup with the pulp too. VeggieGirl, it’s been a long time for me, too, but eggplant season is just around the corner. Kathy–Yes, portabellos! I’d forgotten the ubiquitous mushroom! Butterbean, the coffee filters draw out moisture. When you take them out of the microwave, they’re all wet. I have a Japanese eggplant I bought Saturday at my local farmer’s market – all I needed was the right inspiration. I bought it to force myself to figure something out to do with it. Your blog was the first place I was going to come, but then to see THIS brand new post! I know what dinner will be tonight! Thank you! This dish sounds amazing! I’ve been loving smoked paprika lately, so maybe I’ll give it a go! Oh I Loooove eggplant. Though I try not to overdo it on the nightshade vegetables. My mom’s arthritis really cleared up when she stopped eating eggplant. sad! i mean, good. but sad! Thank you for the coffee filter tip! This sounds wonderful! My only problem is that I don’t have a microwave. Any alternatives for cooking the eggplant for this recipe sans microwave? Thanks for the lovely recipe, I can’t wait to try it out! Mommy off the Record: See the note in first paragraph of the recipe; you can add the eggplant along with the onions and just cook the dish for a little longer. i love that you can still get soft, yummy eggplant without oil (and the eggplant not sticking to the pan and making a mess). I have a fat-malabsorption issue and can never eat stir-fried eggplant because it’s always so soggy with oil! this coffee-filter trick seems like it would also work well for tofu when you don’t have time to drain it (or haven’t planned that far in advance). i’ll give it a try and let you know! That looks great! I am going to note this one down. I have 4 aubergines sitting in the fridge. The line-up so far is curry and on a skewer. I will add this to my list. Ooh, this has many of my favorite ingredients. And it’s so colorful! My prediction for the next trendy vegetarian item: white bean spread. It’s popping up in hipper restaurants near me, but I won’t complain– I love the stuff! This looks fabulous! I just had eggplant yesterday, in fact–now I think I need to go buy another so I can make this! once you’ve sliced it into rounds or cubes, salt it and leave it for a while. the salt will draw the bitter juices out. then rinse the aubergine pieces well and carry on cooking. Thanks true, Tank, but microwaving actually does a better job of taking out the bitterness and in less time. But the main thing that microwaving does, salting can’t do: it removes much more of the moisture and eliminates the need for oil. I’ve never drunk coffee, so I have no idea what you are describing with the coffee filters. I don’t even know what they look like. Would you please describe the technique with perhaps parchment paper, paper towels, terrycloth wash cloths, cheese cloth, whatever I don’t know?? If you can find paper towels that are certified okay for microwaving (some contain metal fibers, so beware) just use a double layer of them. A dish towel (not terrycloth) or double layer of cheesecloth would also probably work. I’d stay away from parchment paper because I don’t think it is absorbent enough. 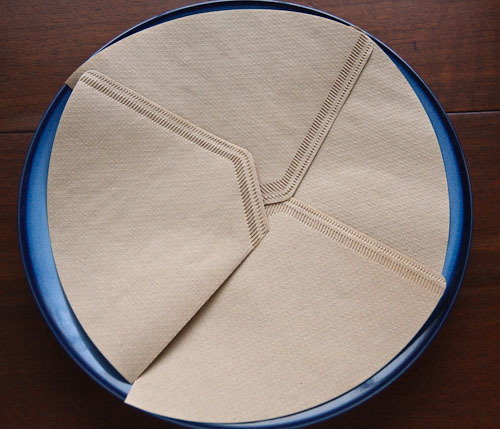 Finally, if you work somewhere that uses unbleached round coffee filters or have a friend who uses them, borrow a couple, open them out flat and use them, in a double layer, to cover the plate. Here’s a photo of the filters on a plate. Note that the filters are unopened, so each one is a double thickness. I love eggplant too! 🙂 Have you tried roasted tomatoes and eggplants on pizza? They are yum! Happily, four out of five of my family members love eggplant too–this sounds really good! I am definitely guilty of feeding my eggplant as much butter and cream that it could handle and then some. I like this rendition, though – well-stocked with perky spices and a myriad of textures, I think this will be my other go-to eggplant preparation. Wow! This dish looks totally delicious. I, too, am an eggplant lover. It’s such a versatile, great, and FILLING veggie. I can’t wait to try out this dish! By the way, I love your expressions: “shiitake out of luck” and “try that with your broccoli.” I want to run around saying these things; they’re so precious! This looks gorgeous. After being force-fed ratatouille as a child I was put off all things ragout/ratatouille related but I think this recipe could really be the thing to break my aversion! This looks great, Susan! I look forward to trying it. We can’t wait to try the recipe. Just the right combination of ingredients for a spring meal. BTW – My hubby laughed out loud at the “shiitake out of luck” comment. The spices in this sound absolutely delicious, and I’m always happy to get to add quinoa to a dish! Thank you for sharing… I can’t wait to go veggie shopping next week! Yum! 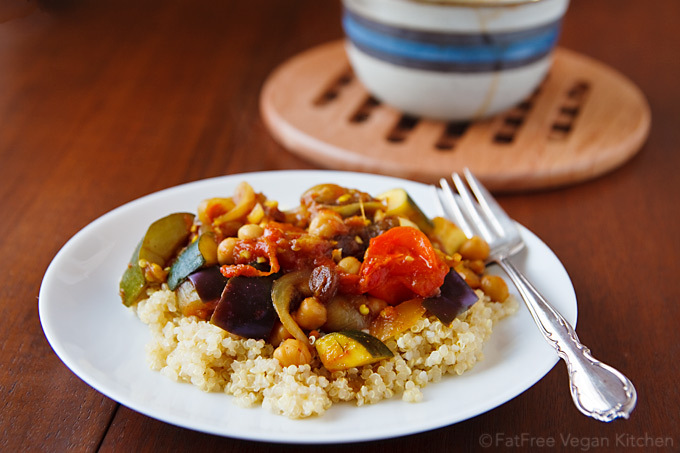 I’m making this tonight for dinner…I have an eggplant to be used and this looks perfect! this looks delicious! i love anything with harissa! beautiful pictures! Delicious!! I’m definitely putting this on my list of recipes to make this summer when lots of eggplants and zucchinis are here. This looks fantastic!!! I love eggplant and I love quinoa. I will try it out soon!!! Thanks for all your wonderful recipe ideas! You’re a huge inspiration! You’ve done it again, Susan – although I may be a little biased, I love eggplant as much as you do and always get excited when you use it! I’ve had a really busy week and haven’t been eating well at all – which cumulated in me lying awake at 3am Friday morning. I was overjoyed to find you had posted a new recipe and decided it looked like the perfect healthy vegetable-laden Friday night dinner. It was! I used paper towels instead of coffee filters and it turned out fine. I made this last night and it was a big hit, even with my very non-vegan friends. Thank you for another great recipe! Although, next time I think I’ll add some red bell pepper. Oh, Susan, I can’t wait to try this. I’m so excited about this recipe! The little pot is my favorite part about this post! Hi! I really enjoy your site and have tried a few recipes, all turned out great. I wanted to ask you how do you calculate the nutritional facts about the food, as I’m starting my own cooking blog and I would like to put such figures in it. Thank you a lot in advance! Susan — Made this tonight. It was so fabulous. I used two plain old Bounty paper towels instead of coffee filter and otherwise followed your directions exactly. Perfect. This microwaving trick is so great because I could never figure out how to get the eggplant cooked AND ALSO have it maintain its shape and taste so delicious. You’re great.. I am beginning to realize that if the recipe is yours, I just KNOW I can trust it to taste fabulous. Susan, this is my favorite kind of recipe that you post: simple, healthy, and full of flavor and spice. This kind of meal also makes me a true fat-free believer; oil just isn’t necessary when you have so much else going on. I’m definitely going to be making some variation of this over the next few weeks. Keep ’em coming! Katya, check out the info at the top of this page. Angela, I’m so gld you liked it! It sounds like you and I must have the same taste in recipes. From being an avowed eggplant hater in my youth, I’ve grown to really seriously love it. Last night’s dinner was roasted vegetables (potato wedges, carrots, summer squash, eggplant, and asparaguts lightly tossed in oil and lightly seasoned with salt and pepper) with black rice and a truly droolworthy sauvignon sauce. My husband even had seconds! Wowly-wow-wow! Thanks for the recipe 🙂 And for the reminded I’m running out of quinoa and need to add it to the list! I love your blog. Great meal ideas! This looks great! I’m so addicted to your soups/stews. I made it and love it!! Thank you!! Well, today was a day of adaptations. . .when I went to make this, I decided to use a can of Muir Glen Crushed Tomatoes. . .and I had made some baba ganoush earlier in the week, which gave me the idea to make some more and put the eggplant in that way. I also added some reconstituted dried tomatoes along with the raisins. Can’t have garlic right now, didn’t have chili sauce, so added a little fennel, a little black pepper, and a little bit of red pepper flakes. It is really yummy! Thanks, Susan! Thank you a lot, now I use master cook for my blog and it really does a great job! Keep the good spirit! Just wanted to say that I find your blog really inspiring. I love cooking and creating new dishes! Last night my partner and I tried out this ragout… it was AMAZING. A really delicious, warm-in-your-belly Winter meal. FULL of flavour. I was really impressed (especially as internet recipes can be very hit-and-miss sometimes). Thanks for posting this, it’s going to be a regular meal in our house now!!! I think the main reason keeping me from getting one at this point is the cost factor, combined with then needing to learn how to use it. Is there anything in particular you would suggest using instead of raisins? I really don’t like raisins cooked into foods for some reason, so can I just take them out of the recipe, or should I add something else sweet, like maybe a little sugar, to replace them? Otherwise this looks really delicious. I’ve only recently realized how great cinnamon is in savory foods so I’m excited to make this! Natalie, the raisins are not essential so you can just leave them out. Hope you enjoy! Natalie – I feel the same way. I just left the raisins out… it was PERFECT!!! Why did I never think of subbing quinoa for couscous. It tastes so much better, and it’s not any harder to make than couscous. Thanks for the suggestion! When you say “6 servings” does this mean it’s about a cup per serving? Emily-Lou, I didn’t measure it, but I’m pretty sure the servings were bigger than 1 cup. I would guess 1/2 cup of quinoa and maybe 1 1/2 cups of the vegetables. The 6 servings indicates 6 main dish servings, what fits on a plate with salad or other side dishes. This one didn’t require much in the way of side dishes because it contained vegetables, grains, and beans all-in-one. This is amazing! It is by-far the best thing I have made. Highly Recommended. I made this tonight and my whole family loved it! Thanks so much!!! I’m eating this right now, and I don’t even care how much it’s making me sweat in the summer heat. Oh so good. This recipe looks really delicious. My only question is, is there something you would suggest as a substitute for the eggplant? No matter how hard I try I just can’t get into eggplant. I was thinking just adding more zucchini (maybe mixing up green and yellow zucchini), but I was wondering if you had any other ideas. OMG this was good. The left overs were even better. I mean this was *really* good! And it was only the first recipe I’ve tried off this site. Good point about the chickpeas. Usually I say “rinsed and drained” but somehow I left that off. So glad you figured it out and it turned out well for you! I tried this tonight and it was fantastic!! I had to substitute dried cranberries for raisins but it worked out great. This is something I will definitely be making again and again. Thanks for posting! I made this for the first time last evening: it was outstanding! I used hot smoked paprika, and that plus the chili sauce gave it a nice amount of heat. Wonderful recipe- thank you, Susan! I’m trying cumin, turmeric, and smoked paprika for the very first time. Although I’m excited about trying your recipe for Tunisian Vegetable Ragout with Quinoa, I was let down a little bit when I learned how expensive these spices were. Normally, I wouldn’t mind buying them to add to my spice rack, but I wasn’t sure that I would care for them. So, instead of cumin and turmeric, Kroger just happened to have a sale on organic curry powder. My question to you is: Would it be okay to use curry powder in place of cumin and turmeric in the recipe mentioned above? It’ll taste a little different, but it should work because cumin and turmeric are usually ingredients in curry powder. Hope you enjoy it! This recipe is absolutely amazing and very easy to prepare. I wanted to up the protein content (I’m a competitive weightlifter) so I increased the chickpea amount by 50% and added a block of extra firm tofu. It came out very well. Thanks for this recipe, I’m very new to vegan eating and recipes like this help me mix it up a bit. I made this yesterday; it was delicious and will make it again. I’m not sure if I read incorrectly, but I thought quinoa was a seed, not a grain. This was / is amazing! very easy and very tasty! I love your recipes – thanks so much for making them so easy to print! I do that almost daily! I made a big batch of saffron rice last night. Can’t wait to eat it with this! We just had this wonderful dish for dinner. Thank you for another great recipe!!! I have never been an eggplant fan because the bitterness is always pronounced for me. This microwave technique took care of the bitterness….there was none. This is the best eggplant containing meal I have ever had (I usually pick around the eggplant in a dish that others enjoy). My husband loved it, too. I had two eggplant, so I used both. I did not have any fresh tomato to use a a garnish, but that would be pretty. I had frozen, cooked chickpeas (Instant Pot) instead of canned. I used heaping measures of the spices. I used Massel vegetable boullion powder with water instead of vegetable stock (it is low salt, so I added a little salt). . The only major ingredient that I did not have was harissa (thought I did, but was incorrect). To substitute, I used a teaspoon of Asian chile/garlic condiment and a half teaspoon of crushed red pepper flakes. It was great! Nuts are ok for my husband, so I sprinkled a little bit of slivered almonds (toasted would have been even better) on his as a garnish and texture embellishment. We have leftovers that we are looking forward to having for lunch tomorrow. We will make this recipe again. It was perfect with the quinoa. Again, thanks for another great dinner! So delicious! I opted to cook the eggplant with the onion as noted. Also, I’d roughly chopped 10 cloves of garlic for a different recipe that were mistakenly added to the quinoa instead, but I didn’t mind at all! This was even better the next day!